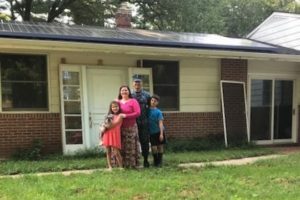 Help us help a local military family! We will be supporting repairs to a house in Western Howard County owned by the Pena Family. We invite you to learn about the family and their current situation. We are in the process of pulling building permits and planning the renovation. Our first work day will be Saturday, September 15. Additional work days will likely follow in September and October. Work will include additional demolition, framing of new interior walls, hanging sheetrock, painting and yard work. The work day will begin at 8:30am and continue until 4pm. We are asking each volunteer to contribute $10.00 to help cover the cost of the materials. (DreamBuilders will cover any amount over the total donations.) Lunch will be provided by Casey’s Crab House. No skills are required, but a few skilled do-it-yourselfers would be appreciated. We will provide a list of recommended tools prior to the workday. Carpooling is recommended, as parking at the home is limited. There is a park and ride at the intersection of I-70 and 32, about three miles from the home. You will receive an email by September 12 with directions and tools needed as well as a liability waiver that must be signed by volunteer and parent (for all volunteers under 18). To get you started, tools should include – tool belt, hammer, safety glasses, square, pencil and tape measure. If you sign up and then can not attend, please let us know ASAP so someone else can go in your place. Contact john.mcbeth@verizon.net . Lunch, water, and snacks are provided by DreamBuilders.